Dana White says Conor McGregor shouldn’t run to him for help after the MMA icon was slapped with assault and criminal mischief charges in Brooklyn early Friday. 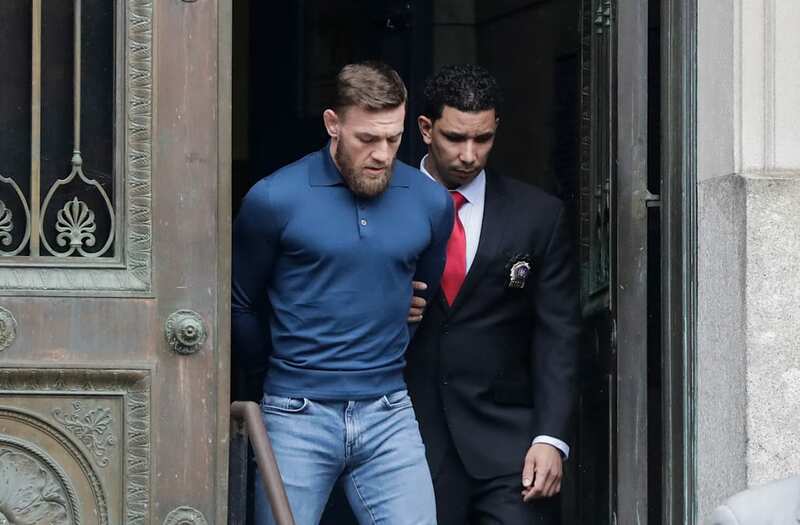 McGregor, 29, turned himself in at the 78th Precinct Stationhouse in Park Slope, Brooklyn, after he and his entourage were caught on video Thursday hurling chairs and dollies through the front windshield of a bus carrying several fellow MMA fighters inside the arena’s parking garage. Nurmajomedov, who got into a reported hotel scuffle with longtme McGregor training partner Artem Lobov, was on the bus with the other fighters, which caused McGregor’ blowup. One of McGregor’s cohorts also allegedly threw a chair through the bus’s windshield. White said the shattered glass cut Norg’s eye. Chiesa was also cut up and bloodied in the brouhaha, according to TMZ. The UFC canceled both fighters’ bouts, along with Lobov’s. McGregor has been charged with three counts of assault and one count of criminal mischief, cops said. Cian Cowley, 25, McGregor’s friend and fellow Irishman, was also charged with assault and criminal mischief, according to police. White said he had been working on a new mega-deal with McGregor, but those plans have now been scrapped after what White termed “the worst thing ever that’s happened” in UFC history. “His passport was tagged so he couldn’t get on his private jet to fly back to Ireland. Conor’s in a lot of trouble,” he added.